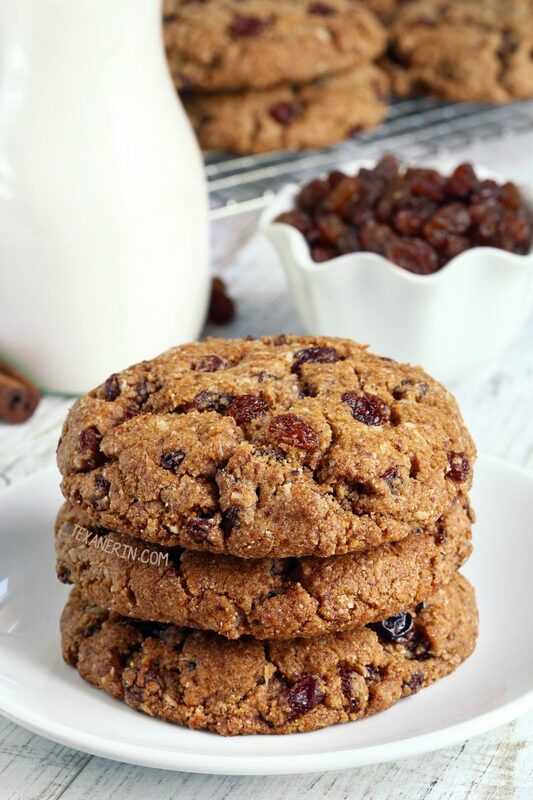 These paleo oatmeal cookies (also known as n’oatmeal cookies) are crisp with a chewy center and taste just like classic oatmeal raisin cookies! Recipe has a vegan option and video. Thanks to Nordic Ware for making today’s post possible. First of all – is oatmeal paleo? Nope. 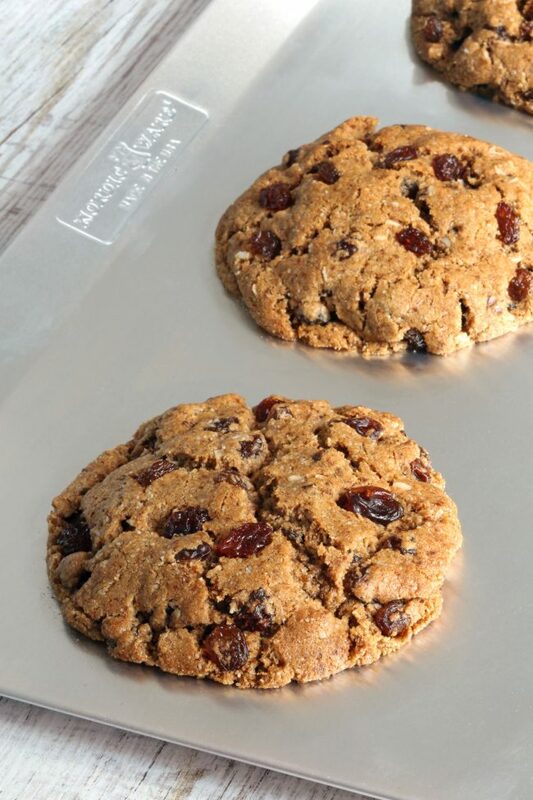 Due to the lack of oats, these paleo “oatmeal” cookies don’t really look like regular oatmeal raisin cookies, but to me, they taste exactly like the real deal. And not just any old oatmeal cookies, or healthy oatmeal cookies, but really amazing soft and chewy ones! To make up for the missing oats, I added shredded coconut and ground flax seed. It sounds weird, but it works! 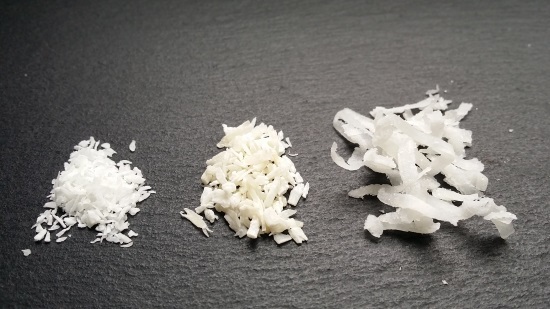 Make sure to use shredded coconut, like the left two in this picture, and not flaked coconut, which you see on the right. If oatmealess oatmeal cookies sounds too odd for you, try my gluten-free oatmeal cookies. They’re even tastier than the original gluten-filled kind, in my opinion! These no-bake oatmeal cookies are also awesome and perfect for hot summer days. I used refined coconut oil in these paleo oatmeal cookies and they came out with absolutely no coconut taste. If you use unrefined coconut oil, they’ll likely have a bit of coconut taste to them, though it shouldn’t be at all overwhelming! Sometimes it makes a difference and sometimes it doesn’t. Like in my paleo lemon bars, I think unrefined is actually better. You can’t taste the flax, either. It somehow just makes the cookies more oatmeal-like! If you have whole flax seeds, an electric coffee grinder is a great tool to grind them. This recipe is based on my paleo chocolate chip cookies. Unlike that version, I haven’t made these with butter or brown sugar (for a non-paleo version). I’m guessing that they’d work but since I haven’t tried it, I can’t say for sure. I also don’t recommend playing around with the recipe (unless you’re okay with them not coming out as intended). This is one of those recipes I had to make over 30 times to get right, which is madness considering it’s based on another recipe! If you omit the coconut or flax, the cookies won’t have the right texture as I had to make a lot of changes to the recipe to accommodate those two ingredients. I’d just make the original recipe and add raisins instead of chocolate chips if you don’t want to add flax or coconut. 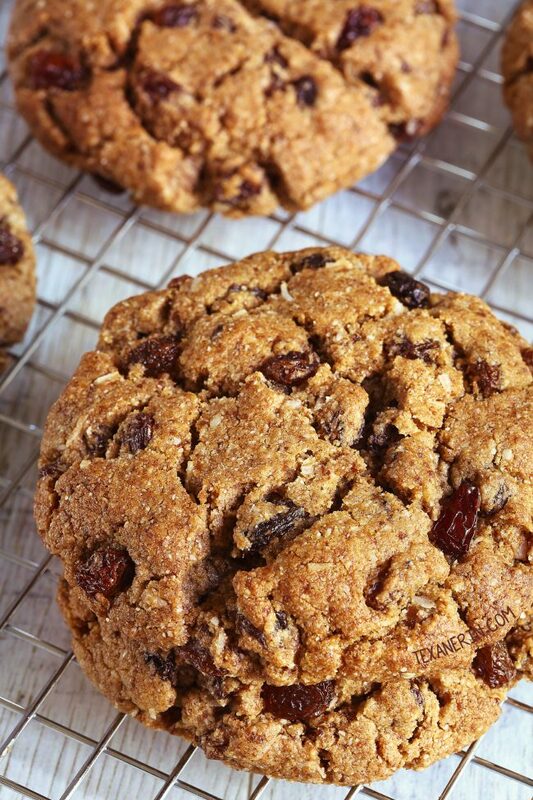 If you want to make these as vegan oatmeal raisin cookies, just use a flax egg or chia egg! Both work great. And if you’re thinking you’d like to add a little more coconut or flax seed or another add-in like that, then be prepared for some super dense and chewy cookies. The first dozen batches or so were work to eat. Eating cookies should never require too much effort. ;) These paleo n’oatmeal cookies are chewier than the chocolate chip version, but I figured that was fitting for oatmeal cookies! Even something as simple as adding more cinnamon had a weird effect on these cookies! I’ve made them with 1, 1 1/2 and 2 teaspoons of cinnamon. 1 teaspoon was just perfect and any more than that made the cookies bitter. I’ve gotten so many of the same questions on the original recipe that I’ve answered any questions I think you may have in the footnotes of the recipe. Be sure to read those for general tips and notes on subs! Don’t want to use almond flour? 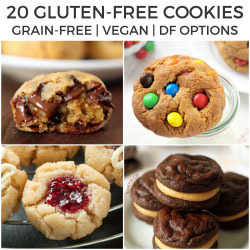 Try these Gluten Free Vegan Oatmeal Chocolate Chip Cookies from Beaming Baker! I’ve posted a few recipes using Nordic Ware Bundt pans, like this coconut rum cake and this bourbon pumpkin cake but did you know that they make so much more than awesome Bundt pans? As I was browsing their site thinking about what products my readers may especially be interested in, the Naturals Bakeware line jumped out at me. I’m guessing I’m not the only one here who avoids pans with non-stick coatings. Some people say they’re safe but I’d rather not risk it. The Naturals Line contains all your baking basics like cake pans, muffin pans, jelly roll pans, loaf pans, pie pans and more — and none of them have non-stick coatings! Something else that I thought is neat is that this line is perfect for gluten-free baking. Wheat alternatives, like the almond flour and coconut flour used in this recipe, need a natural surface to grab on to as they rise during baking — and an uncoated baking pan is ideal in such situations. I’m not sure why, but most of the baking sheets in Germany are black or very dark gray. The first few months after moving here, I burned the bottom of all my cookies, not realizing the cookie sheets were to blame. Since then, I know how important a good baking sheet is! So I wanted to give Nordic Ware’s Insulated Baking Sheet a try. I’d never had an insulated pan before and so naturally was intrigued. What makes this baking sheet different? It has a cushion of air between two layers of aluminum, which helps prevent over-browned cookie bottoms and overdone pizza crusts, especially in ovens with hot spots. That’s a problem in my oven and I usually have to rotate the cookie sheet halfway through. I didn’t need to do that when I used this pan and they came out perfectly! And just like all the other products in the Naturals Bakeware line, the baking sheet is made of natural pure aluminum that won’t rust and produces evenly browned baked goods every time – and it’s sustainably manufactured in the USA. Thanks again to Nordic Ware for sponsoring today’s post! By the way, they have a bunch of amazing new items, which you can find here. I can’t wait to get my hands on that Lotus Bundt Pan! Isn’t it pretty?! Please read the footnotes at the bottom for tips and notes on subs! In a medium mixing bowl, stir together the almond flour, coconut flour, coconut, flax, cinnamon, nutmeg, baking soda and salt. Set aside. In a large mixing bowl with an electric hand mixer or using a stand mixer, beat together the coconut oil, sugar, almond butter and vanilla extract at medium speed until well combined, about 1 minute. Beat in the egg on low and mix until well incorporated. Stir in the flour mixture until well combined. Then stir in the raisins. Refrigerate for at least 30-60 minutes or until the dough is firm and easy to roll into balls. Move the oven rack to the bottom position in the oven. Preheat the oven to 350 °F (175 °C) and line a baking sheet with a piece of parchment paper. 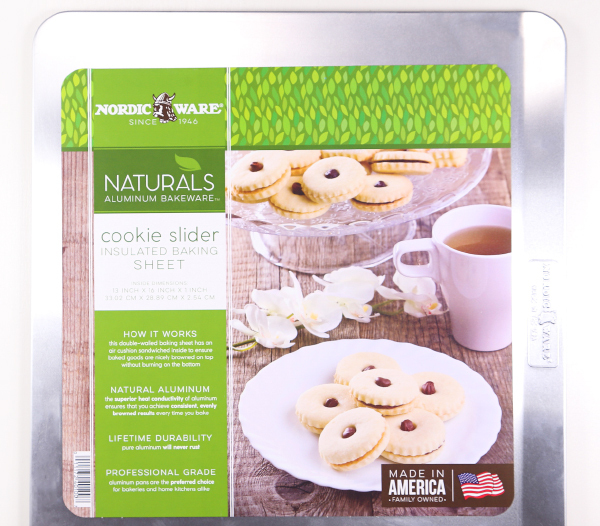 If you use the Nordic Ware Insulated Baking Sheet, you don't need to use parchment paper. Roll the dough into 8 (95-gram) balls. You can also roll them into smaller balls but then you need to reduce the baking time. Place 4" apart on the prepared baking sheet. Press the cookies down lightly with the palm of your hand. Bake for 14-18 minutes or until the surface of the center of the cookies no longer appears wet. They'll be very soft but will continue to cook as they sit on the cookie sheet. Make sure to use shredded coconut and not the flaked kind, which is like long strands. I used unsweetened in these cookies but sweetened should also be fine. I prefer to use refined coconut oil, which has no coconut taste. If you use unrefined coconut oil, your cookies may have some coconut taste to them. If your coconut oil is a little melty, put it in the fridge for about 10-20 minutes or until firmer, like softened butter. If you use slightly melted coconut oil, the dough will be greasy and the raisins will be hard to incorporate. I haven't tried these cookies with butter, ghee or shortening or anything other than coconut oil. I'm pretty sure butter would work but I'm not sure about the others. I don't recommend using honey, maple syrup, date syrup, etc. They make the cookies very cakey and, in my opinion, not worth making. Use the kind with just almonds and salt. I haven't made these cookies with other nut butters so I'm not sure how they'd come out with other types. I definitely think they'd taste less oatmeal cookie-like and it may also have an effect on the texture. I don't recommend omitting these. If you don't like raisins, use dried cranberries, cherries, etc. in their place. I added 3 tablespoons of raisins to the tops of the cookie dough balls just so there would be some raisins sitting on the top so the cookies would look pretty for the pictures. It has zero effect on taste. 74 comments on “Paleo Oatmeal Cookies (vegan option)” — Add one! Just made these and my husband LOVES them! We are eating paleo, and this is the first cookie I made that was just perfect! They’re so good that I now have a batch of the Chocolate Chip ones in the oven. I can’t wait to try some of your other recipes now! Thank you so much for being so innovative! Erin replies to Karen B.
I am curious why you said to move the rack to the lowest position and bake there? They seem so perfect but that did make some overcook /burn on the bottom. I added cashew butter to them and chopped dates instead of raisins – for the most part they turned out awesome. Aww, I’m sorry some of them burned! I tried baking them in the middle several times but the bottoms were always undercooked and I couldn’t get them off the cookie sheet in one piece. Putting them in the lowest position fixed it! You didn’t put them on the bottom of the oven, right, but on the lowest “shelf” (can’t think of the right way to say this just now!) Just want to make sure! I don’t really think there’s a good sub for coconut. It took a lot of work to get the proportions right on this recipe so I wouldn’t recommend just omitting it! Sorry about that. Thanks Erin for answering. I’ll buy the coconut tomorrow, as I want the cookies to be perfect. Awesome! Hope they’ll be worth the trouble of a trip to the store. :) Enjoy! These are a family fave! Everyone loves them and say they are better than regular cookies. Thanks so much for all the great recipes! Better than regular cookies? Wow, thanks! I was very happy to read that. :) Thanks for your comment! Yay! I’m thrilled that you were impressed. :) Thanks for your comment! Yummy! made these tonight for our gluten free and dairy free dinner guest needs. They were a hit! My go•to will forever be your paleo chocolate chip cookies (the. best. ever. ), but these were delish and nice to change it up! … Now on to try your next recipe! thanks for all you do! I’m so happy that you enjoyed them and that they were a hit! And glad that you love the chocolate chip cookies. :) Hope you’ll enjoy the next recipe just as much. Thanks for your comment and sorry for the slow reply! I’m in the process of moving and haven’t had internet since Sunday. omg. i made them. amazing recipe. thank you!!! i used peanut butter. i will make it again and again. im going to try other recipes too. blessings!!!! Woohoo! I’m so happy that they came out well with peanut butter. :) Did they still taste kind of like oatmeal cookies or not really? 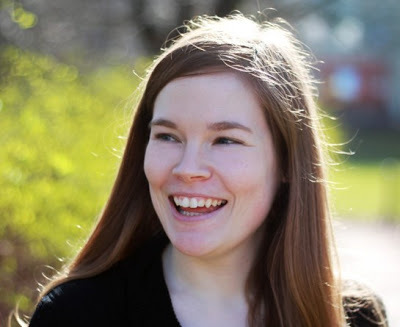 Thanks a bunch for your comment and I hope you’ll enjoy the other recipes just as much! Yes. It does taste as oatmeal but you can also taste the peanut butter. i’m sure that almond butter will have a milder taste. Don’t want to use flaxseed in oatmeal cookies, digestive reasons, what should i substitute with? I haven’t tried anything else. Maybe ground chia seeds would work? I have no idea, though, if it’d have the same effect. These are really good! Just like “real” cookies. Family agreed, and that’s no small thing. Thank you, Texanerin Baking. I ran out of almond butter and used half natural peanut butter and they were still amazing! I go to Texanerin Baking first because I know I will not be disappointed. Erin replies to Crystal K.
Oh my gosh. Sorry that I’m just now responding! I’m very happy that you enjoyed the cookies and what a nice thing to say. :) Thanks a ton for your comment and sorry again for the ridiculously slow reply! I love these cookies and I need that pan. I had no idea they made cookie sheets. Can’t wait to use this pan when I make your cookies. Right?! I had no idea they make so many awesome things other than Bundts. Hope you’ll get your hands on that pan soon! I’m a sucker when it comes to oatmeal cookies! These look amazing!!! These look amazing! I love that different options! Is there a way you can add the nutrional values at the end of recipe. Calories, carbs.,fat, sodium, fiber? They look so delicious! Thanks! And unfortunately, I’m not a nutritionist or a dietician and because of this, I’d be uncomfortable providing nutritional information. I’d hate to give out false information, especially when it could result in a problem for someone. Many of my readers like using Calorie Count to figure out the nutritional profile. Sorry for the inconvenience! Thank you so much for the link to the nutrition label maker! I have wished for something like that. I also am not a nutritionist, but offer my result from that website for others to use at their own risk. I did not include the extra +2 tbsp in a couple of ingredients, it was not recognizing the multiple measurements and I was too lazy to create separate lines. Of course, they are calorie dense, but with a good profile of protein and fat and amount of carbs (wish it was less sugar though.) At 8 cookies per batch, these are nearly a stand alone meal. Would be great for breakfast on the go. For a snack or dessert, I would definitely halve the size of the cookies. They are nearly 450 calories each. With 29 g of fat, 30 g of sugar, and 8.2 g protein. Thanks for sharing! And I’m happy you found the link useful. :) I hope that you enjoyed the cookies! To reduce the sweetness, I used 1/2 cup coconut sugar, and 1/2 cup raisins. And I made a mix of almond butter and peanut butter, both extra crunchy. Texture and flour are great. Next time I’m going to use less sugar. See if it works out well. To make balls, I used an ice cream scoop. Made 7 cookies out of the dough. Just baked these cookies this morning and they are awesome! Thank you so much! I didn’t have enough almond butter so added up some natural peanut butter to the almond one I had. They still taste amazing! A question here: do you think they will still be the same, if I add erythritol instead of coconut sugar and make them low-carb? I’m totally intrigued by these cookies and the substitutes you made to turn them into paleo oatmeal cookies. Definitely trying these. These sound terrific, I can’t wait to try them! I love these cookies! I want a stack for snack today! Wow Erin, these cookies came out perfect! I love all the work you put into your videos and I’m going to look for the naturals Nordic Ware. Thanks so much! And I hope you will. They have so many great products! Well if it took you thirty times to get this right then That just means they are totally perfect and I must try! Haha. Right?! I’m so happy with how they came out, though. Totally worth it! 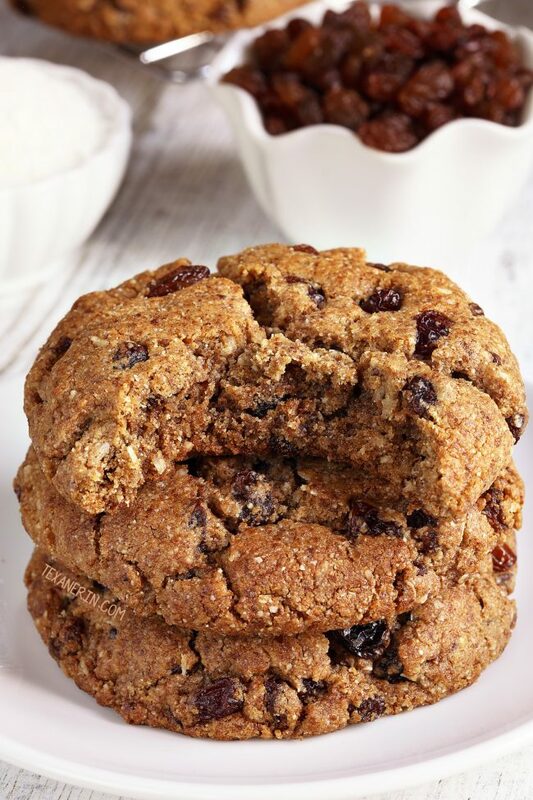 These Paleo “oatmeal” cookies look amazing, Erin!! 😋 They look soft and chewy just like regular oatmeal cookies! Definitely another must-try recipe from you! 😉 Also, thanks for the info on the great baking products! I love that these are grain-free — and yes, those flavors of oatmeal and raisins are so comforting. These are baked to perfection. I definitely need to invest in some new bakeware! Indeed you do! Definitely check out the Naturals Line. It’s right up your speed! What gorgeous cookies! I have a couple of insulated baking sheets, and they really do work better than anything else! I’m super impressed with the baking sheet! I no longer have to turn the sheet halfway through and I LOVE that. I SO need these in my life! It’s only Tuesday and I feel like it should be Friday! 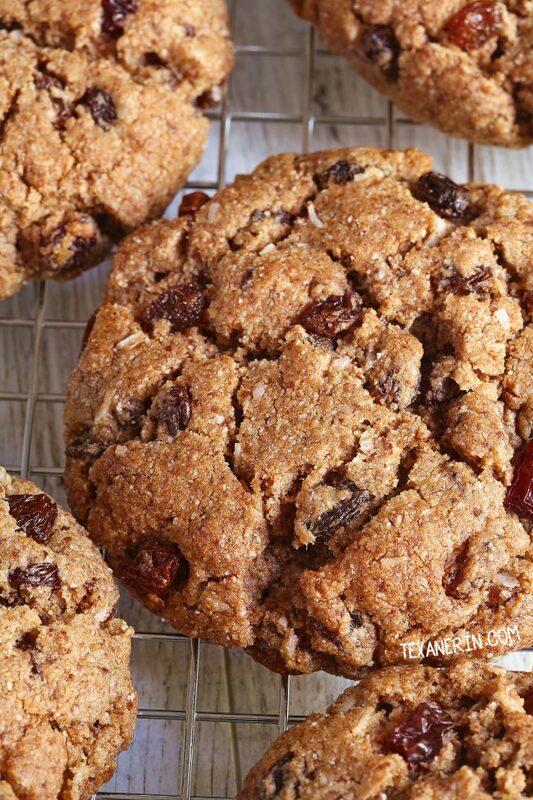 And these Paleo N-oatmeal cookies sound amazing. Oh wow! These cookies sound amaaazing!! I’ve got to try this recipe!! These cookies are so beautiful!! I can just see how soft they are! These sound amazing right now. PS – totally off topic, but I’ve been really missing Berlin. Hope all is well with you! Haha. Really?! I’m still clamoring to get out. ;) Hope things are going well for you, too! What a great recipe! Can’t wait to try it with the almond flour. These. Are. Brilliant! 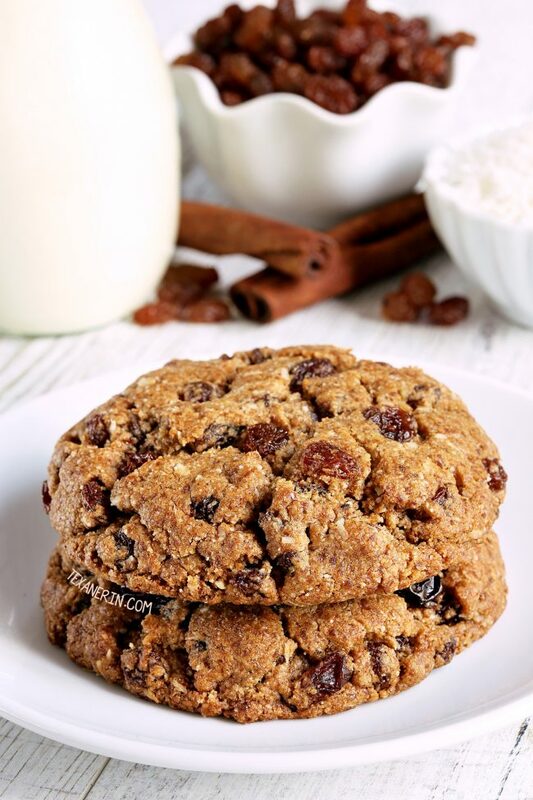 I love a good oatmeal cookie, so I want to try this “oatmeal” cookie! I could totally munch on these all day long! Yum! Would like to see the nutritional information on these cookies. These would be so good right now. I am fixing to go to bed so these will have to be for another day. HA! !